click.to eBay is 3, 2, 1 …. yours! The moment is coming – your best friend is finally moving from New York to Miami! He just sent you an e-mail asking for some advice on where he can find some used furniture. What are you going to do? 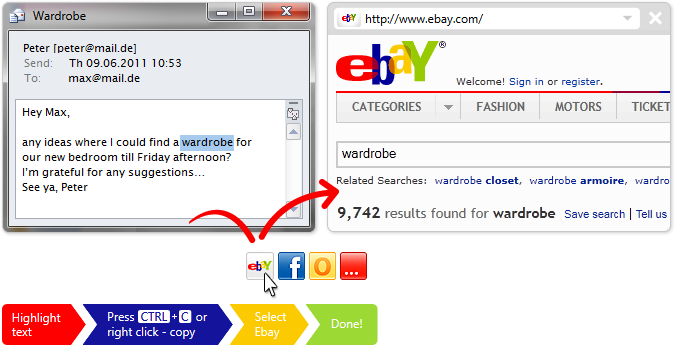 Highlight his search words in the email, for example “wardrobe”, press CTRL + C or right click -> Copy and click.to eBay. You can then highlight the link with the search results and click.to e-mail him back!! Welcome to paradise! With click.to, eBay can be reached from anywhere on the desktop – even without a previously copied word on the clipboard. Just enable “Quick Access” in the click.to options menu and view the click.to satellites by moving the mouse cursor to the top of the screen. Select eBay and enter your question: click.to automatically opens your Internet browser,goes to the eBay and enters your search results immediately!